30 Second Wine Advisor: Older or better? Here's one of the many things about wine that distinguishes it from milk, iced tea or Coca-Cola: It changes with time in the bottle in strange and mysterious ways. You can assume that most beverages have a brief shelf life before they turn rancid or sour. With wine, not so much. Now, this is not to say that all wines improve with age. Most of the world's wines are meant to be drunk up right now, or within a reasonable time after you bring them home from the store. But even modest table wines will generally keep for a year or several, and within reason, you don't absolutely have to have a temperature-controlled wine cellar to watch them grow. I recently returned for a re-taste of a French Chardonnay that I first tried about a year ago, and I found it had gained some refinement with time in the bottle. Domaine Lafage 2008 Novellum "N" Chardonnay is a Vin de Pays that hails from the Côtes Catalanes, the hilly vine country where the Pyrenees meet the sea and France meets Spain. It sees just a little oak, and, oddly, spends a bit of time on the lees of Viognier before bottling and early release. This wacky procedure yielded a wine that, initially, was just about overwhelming in its frooty, floral character. In August 2009 I described as "odd but slurpy," so fruity it almost seemed sweet. Tasted again recently, it had turned the contrast and brightness down to normal. Still fruit-based, it's now more subtle, with a fully dry impression on the palate and tangy snap of lemon in the finish. You'll find my tasting report below. Sure, we know that thinking about the holidays during the summer is tough to do, however the money and time you save by planning now make it enormously rewarding in December! During Santa's Summer Sale, you'll save 20 percent per gift, your credit card won't be billed until December and your gifts will be scheduled to arrive right before the holidays. When you are ready to take advantage of the savings and reserve your holiday gifts, call 1-800-777-4443 or visit www.cawineclub.com. Pour yourself something cool, enjoy the summer sun and take a moment to make some holiday plans…we know you will be glad you did. Visit www.cawineclub.com or call 1-800-777-4443 to learn more. FOOD MATCH: A natural match with chicken in a cream sauce, pork or veal, swordfish or tuna. It was fine with swordfish cubed and sauteed with onions, garlic, capers, parsley and lemon over rigatoni. VALUE: Good value, although our local price is near the high end of the range. You may be able to find it under $10 in many markets, at which point it's an exceptional bargain. WEB LINK: The importer offers a short introduction to the producer, Domaine Lafage, at this link. 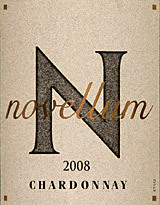 Find vendors and compare prices for Novellum Côtes Catalanes Chardonnay on Wine-Searcher.com.